“Time and Tide” 1994 by Akio Makigawa seems to rise organically from the small plaza on the corner of Swanston Walk and Little Collins Streets. The bluestone, white marble, bronze and stainless steel seems to match with the materials of the city. Part of the sculpture is fitted with fiber optics that emits light creating a different mood at night from daylight. “The individual elements of Time and Tide loosely represent a tree – signifying growth, knowledge and the land – a flame – signifying rebirth and transcendence – and a shell – signifying the ocean.” (City of Melbourne Outdoor Artworks October 2009 PDF) The sculpture appears to grow out of the broad Swanston Walk footpath and the steps leading up to the café. Akio Makigawa was born in Karatsu City, Saga Prefecture, Japan 1948 and died in Perth, Western Australia, Australia 1999. During his life he was a gymnast, yachtsman, sail-maker, print maker and sculptor. He arrived in Perth in 1974 and worked as a sail maker before turning to sculpture. His first major public work was for the Perth Cultural Centre “Gate II Coalesce”, 1987 around the approach line to the State Library. His sculptures are now in most Australian capital cities: “Equilibrium” at the entrance to the Commonwealth Law Courts in Brisbane and “Elements and Being” in the upper forecourt of the Hyatt Regency Hotel in Adelaide. 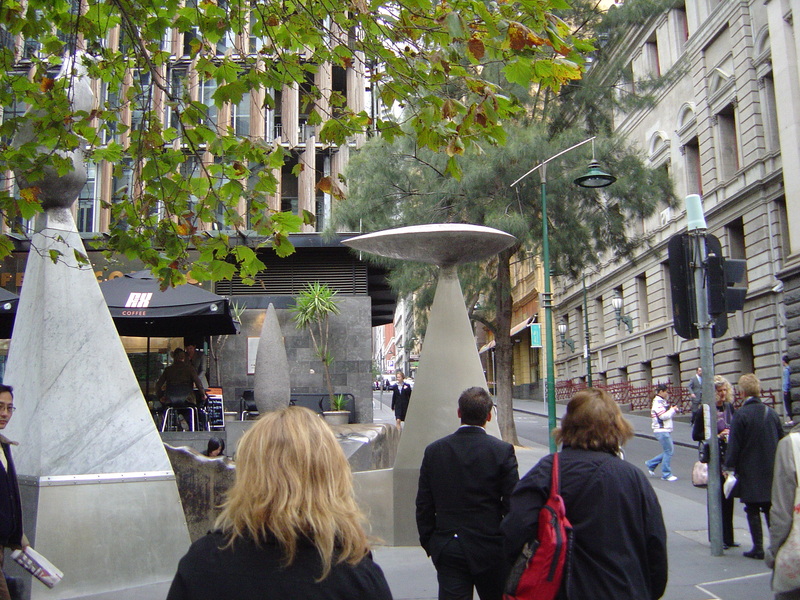 “Time and Tide” is not the only statue by Akio Makigawa in Melbourne but it is the most visible. There is the simple elegance of his pillar-like sculptures in the forecourt of the Victorian Museum, Carlton Gardens. These sculptures are similar to his “Sculpture IV”, 1998, located in the northern courtyard of Parliament House in Canberra. There are two more in the departure lounge at Melbourne Tullamarine Airport shiny and colorful steel, bronze, aluminum and fiberglass sculptures “Journey West” and “Journey East”, 1996. The sculptures of Arp and Brancusi are good comparisons except that Makigawa’s sculpture are on a slightly larger scale in proportion to the architecture around it. Arp in respect to his lyrical reinvention of simple natural forms, in the case of “Time and Tide”, the tree, flame and shell. Brancusi for his sculptural interest in the column and his combination of materials, for example, bronze and stone or stone and wood. In “Time and Tide”, Makigawa use of contrasting materials, the contrasts between curves and straight lines form a counterpoint, between dark and light materials, and metal and stone.